For hundreds of years, fencing has been a part of human life. Made mostly from wood or stone, ancient people used the boundary walls to identify property lines, restrict movement of animals, and designate traffic paths. As people began building large majestic homes, fences also provided privacy and limited entrance into private residences. With the addition of business buildings and company compounds, commercial fencing was designed to meet expanding corporate needs. Fencing materials can now be found in many styles. Vinyl fencing can easily be cleaned and often lasts for decades. The PVC resin material is easy to paint, has a high impact strength, and can withstand extreme weather conditions. Wooden fences have been built for hundreds of years. Made from planks of cut wood, the panels can be built in a variety of styles and can add a pleasing aesthetic appeal. By selecting between pine, cedar, and oak, the fencing durability and life can be modified to fit your company needs. Ornamental fencing is frequently designed for curb appeal. The aesthetically pleasing panels are often made in three-foot to four-foot heights and have large areas between bars making the creative design perfect for open areas around commercial buildings or to designate a walkway. 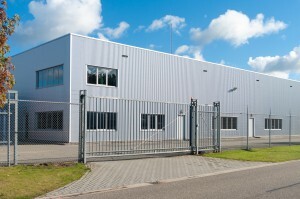 Aluminum fences are one of the most popular commercial fencing options. Durable and weather resistant, the panels require little or no maintenance for several years. As an inexpensive option, the materials can also be chosen in a variety of colors and hues. Chain-link fencing is often regarded as the least aesthetically pleasing type of fencing available for businesses. However, the fence panels are strong, secure, and can have a barbed wire attached to the top of the fencing, so the panels are often chosen as security fences. Commercial fencing can vary between businesses and where the panels are located. Whether your company needs security, privacy, or decoration, a fence to fill your needs can be found – and in a variety of colors.